Morphea is a rare sclerosing disorder of the skin. Linear morphea is commonly seen in children and can affect head, neck, trunk, or limbs. It may extend to involve deeper structures such as muscles, bones, and joints. Involvement of lymphatics or the vasculature is very rare. 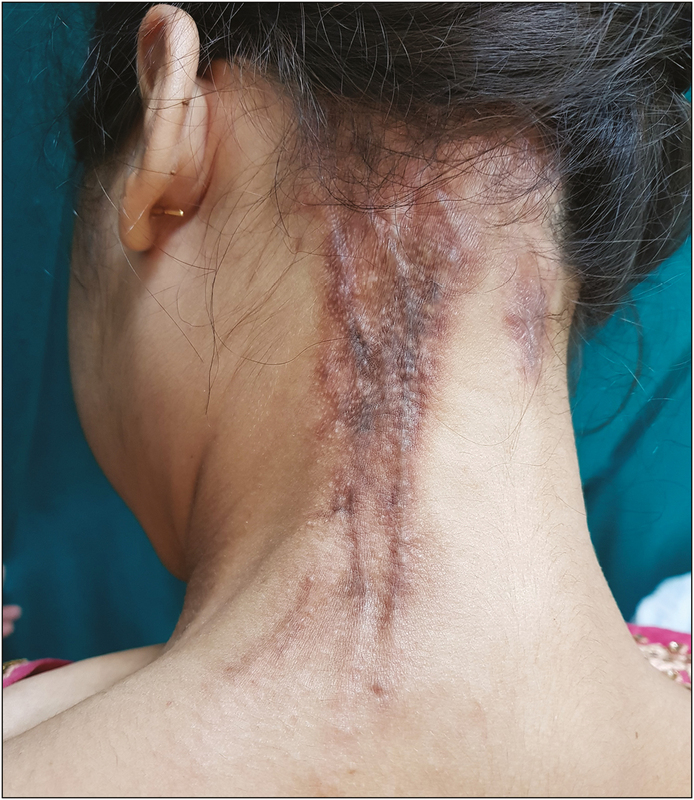 We report a case of a 20-year-old woman presenting with linear morphea involving the nape of the neck and scalp. 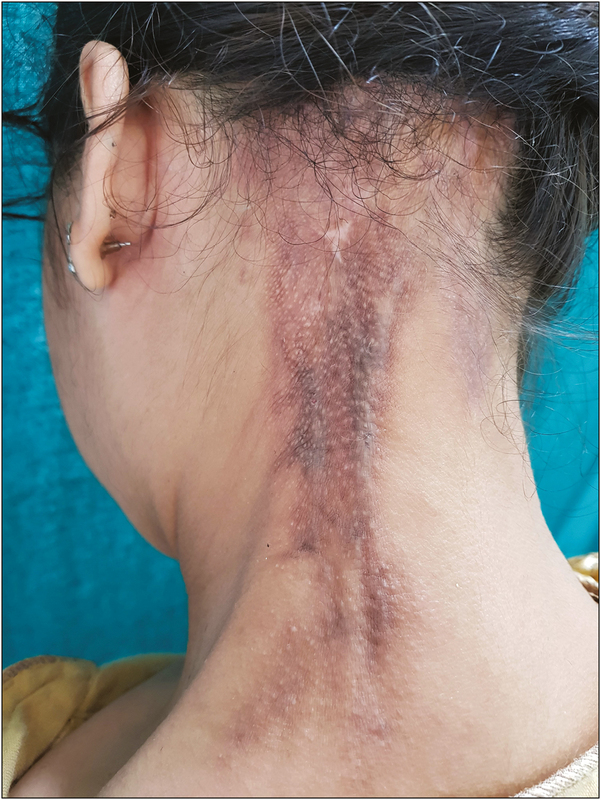 The lesion gradually developed two linear thick cord-like structures within the lesion of morphea because of secondary lymphatic obstruction causing restriction of neck movements. The patient was given intralesional steroid that led to softening of the skin lesions including that of cords, resulting in improvement of neck movements. A 20-year-old woman presented with a hyperpigmented depressed lesion over the back of the neck for the past 10 years. Over the past 3 months, she had noticed gradual development of two thick, linear cord-like structures within the preexisting lesion. This restricted the neck movements, especially flexion, which hampered her routine activities. No preceding evidence of inflammation, trauma, or any local injection was observed. There was a history of multiple topical treatments but without any relief. 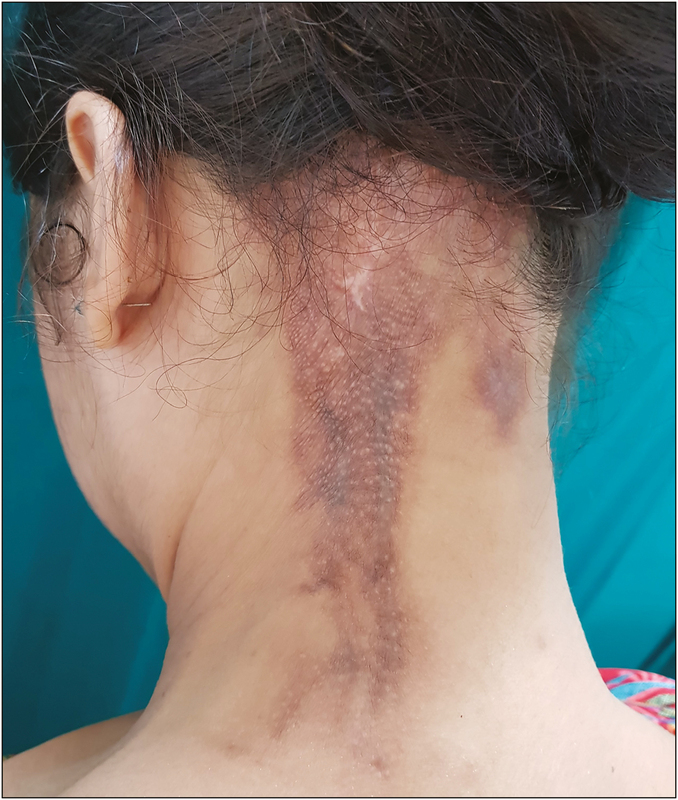 On examination, two linear hyperpigmented indurated plaques were present over left side of the posterior neck (3×3cm and 7×10cm) extending into the scalp with associated scarring alopecia. The larger plaque had two parallel thick linear cord-like structures fixed to the plaque [Figure 1]. Surrounding skin was apparently normal and no lymphadenopathy was observed. Severe restriction in the neck movement (lateral and anterior flexion) was reported. Histopathology of the lesion was consistent with morphea. Ultrasonography showed skin thickening with decreased echotexture as compared to that of the surrounding normal skin. The cord-like structures had decreased echogenicity with few bleb-like structures (dilated lymphatics), suggestive of underlying lymphatic obstruction. On the basis of clinical, histopathological, and radiological features, a final diagnosis of linear morphea with secondary lymphatic obstruction was made. The patient was started on oral dexamethasone pulse (0.1mg/kg) along with intralesional triamcinolone acetonide (20mg/mL) given at 3-weekly interval. In between the injections, she was prescribed topical potent steroids. After 1 month, marked softening of the lesion was observed. After the second intralesional steroid, there was further softening as well as improvement in the neck movements. Ultrasonography showed improvement in the skin thickness as well as echotexture. Neck flexion reached within the normal limit after the 4th month [Figure 2] and [Figure 3]. The dexamethasone pulse was tapered off in 3-month time. No relapse was seen in the next 6 months of follow-up. Morphea is a rare sclerosing disorder of the skin. Traditional classification by Peterson et al. categorizes morphea into plaque (localized), linear, bullous, generalized, and deep variant, which may be pansclerotic., Linear morphea is commonly seen in children and can affect head/neck or trunk/limbs. Because of the tendency of morphea to extend deep, it is often associated with abnormalities in the underlying joints, bones, and muscles, whereas involvement of lymphatics or vasculature is quite rare. Lymphatic obstruction in morphea has been reported in few cases. In most of these, the lymphatic involvement in the lesion is presented in bullous form of morphea.,,, Daoud et al. described 13 patients with bullous morphea of which 77% had underlying lymphatic obstruction. The pathogenesis of bullous morphea is still unknown, but several mechanisms have been proposed, such as inflammation, lymphangiectasia, and immune-mediated aggression. Many of these reports have suggested that compression because of the sclerotic plaque of morphea is responsible for lymphatic obstruction.,,Fiala et al. reported a case of linear morphea with unilateral edema. They postulated that the pathogenesis behind this complication could be lymphatic obstruction, secondary to morphea itself. In all these cases, the level of lymphatic obstruction was superficial. In our patient, the lymphatic obstruction was deep and was seen in the form of sclerosed linear lymphatic cords. To the best of our knowledge, this kind of presentation has never been reported. The lymphatic obstruction in this case is also expected to be secondary to morphea because of the temporal correlation of the onset of lesions of morphea and the appearance of lymphatic cords. The improvement in the plaques of morphea by intralesional steroids was also accompanied by softening of the cords, which strengthened the causal relationship between sclerosis and lymphatic obstruction. Morphea can also lead to lymphatic obstruction presenting as sclerosed lymphatic cords, which can be associated with restriction of movement and significant morbidity. In such cases, lesion should be evaluated for underlying lymphatic involvement. Intralesional steroids may have a role in the management of the lesion as well as the lymphatic obstruction. Fett N, Werth VP. Update on morphea: part I. Epidemiology, clinical presentation, and pathogenesis. J Am Acad Dermatol 2011;64:217-28; quiz 229-30. Peterson LS, Nelson AM, Su WP. Classification of morphea (localized scleroderma). Mayo Clin Proc 1995;70: 1068-76. Samimi M, Maruani A, Machet MC, Baulieu F, Machet L, Lorette G. Lymphatic compression by sclerotic patches of morphea: an original mechanism of lymphedema in a child. Pediatr Dermatol 2010;27:58-61. Angel FF, Michelle GT, Fátima TF, García-Hidalgo L, Monroy E, Saeb-Lima M. Three cases of bullous morphea: histopathologic findings with implications regarding pathogenesis. J Cutan Pathol 2015;42:144-9. Kavala M, Zindanci I, Demirkesen C, Beyhan EK, Turkoglu Z. Intertriginous bullous morphea: a clue for the pathogenesis? Indian J Dermatol Venereol Leprol 2007;73:262-4. Rencic A, Goyal S, Mofid M, Wigley F, Nousari HC. Bullous lesions in scleroderma. Int J Dermatol 2002;41:335-9. Daoud MS, Su WP, Leiferman KM, Perniciaro C. Bullous morphea: clinical, pathologic, and immunopathologic evaluation of thirteen cases. J Am Acad Dermatol 1994;30:937-43. Fiala KH, Wells MJ, Mullinax KA, Stetson CL, Paulger BR. Linear morphea presenting as acquired unilateral edema. Pediatr Dermatol 2007;24:147-50.